I've always had a soft-spot for pausable real-time combat, thanks largely to an early obsession with the Infinity Engine. So it's good to see a game that isn't expressly an Infinity Engine successor—I'm talking about you, Pillars of Eternity—adopt the style over the more widely accepted turn-based brawling. 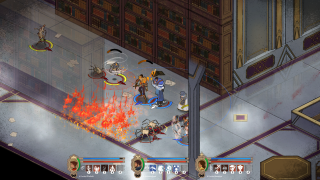 Masquerada: Songs and Shadows is an isometric-RPG set in the Venetian-inspired city of Ombre. "Masks unearthed from the ancient world give destructive magical powers to an elite few," explains the press release. "As civil war rages between the elitist Masquerada and the working-class Contadani, fey creatures start to spread mysteriously throughout the city, paving the way to a darker conspiracy." The above trailer lets you see how destructive those magical powers can be. Masquerada is due out spring 2016, and will be available to try on the PAX Prime show floor on the weekend of August 28. Note: Masquerada is published by Ysbyrd Games. Their 'business cat', Cassandra Khaw, occasionally writes for PC Gamer. She knows a good Thai place in Cologne.